The U.S. Air Force's mysterious unmanned space plane has winged beyond 600 days in orbit on a classified military mission that seems to have no end. The X-37B space plane is carrying out the Orbital Test Vehicle-3 (OTV-3) mission, a long-duration cruise that marks the third flight for the unpiloted Air Force spaceflight program. The Air Force launched the miniature space shuttle into orbit on Dec. 11, 2012 using an expendable Atlas 5 rocket. By Sept. 1, the space plane had spent 630 days in orbit. That's one year, eight months, 22 days and counting, to be exact. The reusable X-37B looks like a mini version of NASA's now-retired space shuttle. This space plane is 29 feet (8.8 meters) long and 9.5 feet (2.9 m) tall, and has a wingspan of nearly 15 feet (4.6 m). The X-37B's payload bay is the size of a pickup truck bed. In contrast, NASA's space shuttle payload bay could fit two X-37B space planes comfortably inside. At liftoff, the X-37B space plane weighs 11,000 lbs. (4,990 kilograms). "While far above the longevity of any other reusable spacecraft, it is far below that of most U.S. satellites, which are built to last for years, even decades," Johnson-Freese told Space.com. "That certainly confirms the broad, officially stated goal of the X-37B as a test bed vehicle." It's logical to assume that the classified payloads tucked inside the X-37B include new sensors and satellite hardware that will be tested, Johnson-Freese said. If so, then the more time on orbit, the more testing that can be done, she said. "While the classified nature of the X-37B has raised some concerns about its intended operational purposes, technically, the program must be commended for doing something new ... and successfully," Johnson-Freese said. The first mission blasted off in April 2010, and the craft circled Earth for 225 days. The second X-37B vehicle launched in March 2011, performing the OTV-2 mission. This spaceflight lasted 469 days, ultimately landing at Vandenberg Air Force Base in California in June 2012. That was the same landing site OTV-1 used after completing its mission. 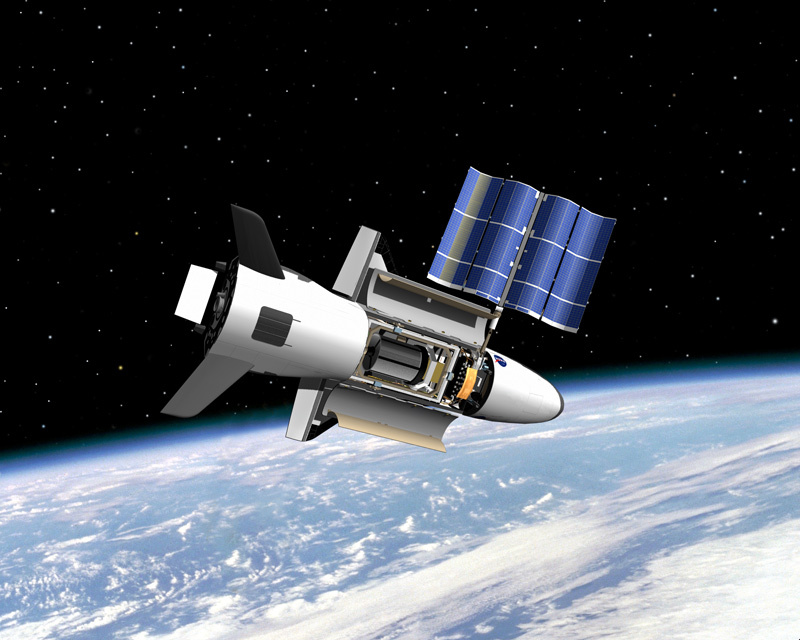 The current OTV-3 mission is reusing the first X-37B space plane from the OTV-1 flight, showcasing the reusability aspect of the program. What's the mystery mission's secret? "I'll give you my standard line on X-37," Shelton told Space.com at the National Space Foundation's 30th Space Symposium in May. "X-37 is doing great. I can't tell you what it's doing, but it's doing great." Meanwhile, Boeing Space & Intelligence Systems, the Air Force's supplier for the X-37B space planes, told Space.com that there was nothing it could share regarding the ongoing mission. While the purpose of the X-37B space plane program remains stealthy, the U.S. military space interests are clearly visible. In July, Shelton spoke at the Atlantic Council on the U.S. future in space, noting that "space forces are foundational to every military operation, from humanitarian to major combat operations. It really doesn't matter -- space has to be there ... [satellites must be] continuously deployed in place, providing communications, missile warning, navigation, space surveillance and weather services." Traffic is building in space, as many new entrants have joined the ranks of spacefaring nations and "counter-space" capabilities (technologies to deny a nation's use of space assets) are becoming more concerning, Shelton added. Shelton said that the U.S. Air Force Space Command is considering several space tracks, such as lowering the cost and complexity of new space capabilities. "We're watching carefully as other nations significantly increase their investment in counter-space programs," Shelton said. "We absolutely must adjust our approach and response, and the time for those decisions is approaching very rapidly." Will X-37B land in Florida? The Air Force Rapid Capabilities Office carries out the clandestine missions for X-37B space planes, the 3rd Space Experimentation Squadron at Schriever Air Force Base in Colorado handles mission control for OTV flights. The first two OTV missions flew back to Earth on autopilot, each time touching down on a tarmac at the Vandenberg Air Force Base in California. But that could change. Boeing Space & Intelligence Systems has announced plans to consolidate its space plane operations by using NASA's Kennedy Space Center in Florida as a landing site for the X-37B. Earlier this year, Boeing announced plans to expand its presence in Florida by adding technology, engineering and support jobs at the space center. As part of that Boeing plan, investments will be made to convert the former space shuttle facility, Orbiter Processing Facility (OPF-1), to a structure that would enable the U.S. Air Force "to efficiently land, recover, refurbish, and re-launch the X-37B Orbital Test Vehicle (OTV)," according to Boeing representatives. At the time of the Jan. 3 announcement, this construction was to be completed by the second quarter of 2015, Boeing representatives said. Leonard David has been reporting on the space industry for more than five decades. He is former director of research for the National Commission on Space and is co-author of Buzz Aldrin's 2013 book "Mission to Mars - My Vision for Space Exploration" published by National Geographic. Follow us @Spacedotcom, Facebook and Google+. Original article on Space.com.